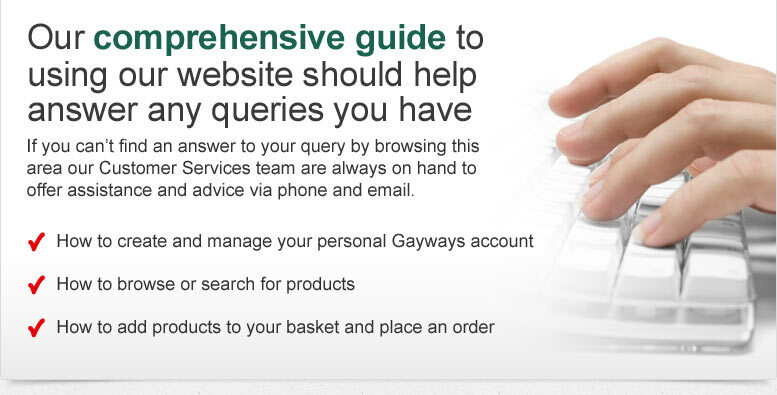 I'm a new customer, why should I register with Gayways? • Buy tools and machinery securely online at any time of the day or night! I've bought from Gayways before but I can't sign in - why? Check the spelling carefully and try again, it must match the address you originally registered with. Check the spelling carefully and try again, it must match the password you originally registered with, passwords are case sensitive. If you have forgotten your password, use the Forgotten Password link under the Returning Customer option. Even as an existing customer you will need to register an online account under the New Online Customer option. You will already have an Gayways customer number (you'll find it on old invoices), entering this if you know it will make registration even easier. If you receive our regular Newsletter special offer mailings you may have only entered your email address to subscribe rather than registering a full online account with a password and your personal details. If this is the case, you will need to register an online account under the New Online Customer option. How do I update my name / email address? Why is my credit / debit card being rejected at the checkout? Check whether you are entering your details as they appear on the card, and that your Verified by Visa or MasterCard SecureCode password is correct. Unfortunately, we are unable to provide you with a specific reason and you will need to contact your card-issuing bank directly for more information. If you continue to experience difficulties while ordering online, please call our sales team on 020 8908 4744 that will be available to take your order via phone. If you would prefer to talk to someone, we're only an email or phone call away!